Menstrual products are now available in every House and dorm. When Arnav Agrawal ’20 decided to run for a seat on the Undergraduate Council during his freshman fall, he ran on a largely single-issue platform: bringing menstrual hygiene products to every dormitory on campus. Two years later, after a pilot program, campus-wide survey, town hall, and multiple meetings with administrators, the UC and a menstrual hygiene advocacy group convinced the College to finally make that platform a reality. Over the summer, the College worked with House building managers to install a dispenser in each upperclassman House and freshman yard that will provide tampons and pads. The dispensers, which custodial staff will fill regularly, are mostly located in gender-neutral restrooms in order to reach students who may not be comfortable in a women’s bathroom, according to UC Vice President Nicholas D. Boucher ’19. The process of gaining financial backing for the initiative from administrators was a long one. After Agrawal was elected in 2016, discussions of the issue began to occur more widely within the Council. And outside of the UC, an advocacy organization on campus called the Hygiene Campaign — now known as PERIOD — ramped up efforts to win administrators' approval for efforts to make menstrual products more accessible. When advocates for the program brought the proposal to College administrators, they said they would require “extensive data” demonstrating need for the products before they might consider funding such a large-scale program, according to Agrawal, now the chair of the UC’s Student Life Committee, and Emma Y. He ’19, president of PERIOD. UC and PERIOD leaders got to work collecting that data. In the spring of 2017, the Council allocated $1,000 for a pilot program in freshman dorms. 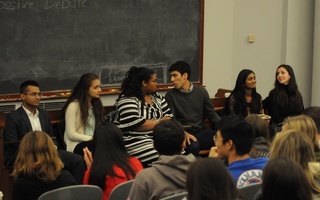 In fall 2017, the pilot was expanded to four upperclassmen houses. By all accounts, the initiative was successful, with supplies frequently exhausted due to high demand. Still, student leaders wanted to bring a stronger case to administrators, so the Council commissioned a survey to ask students about the prospect of wider availability of menstrual products. 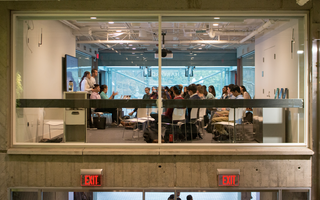 In recent years, UC surveys have received relatively low response rates, most likely a reflection of a broader lack of student engagement with Council affairs. This time was different, though. Over 2,000 students responded to the menstrual hygiene survey, the most of any survey in UC history. One question appeared designed specifically to appeal to administrators: "Do you think that the College should provide students with free menstrual hygiene products in all dorms and public places such as libraries etc.?" the question read. With a strong case for student need for hygiene products in tow, UC leaders went back to administrators to ask for funding once again. This time, administrators “immediately” consented, Boucher said. 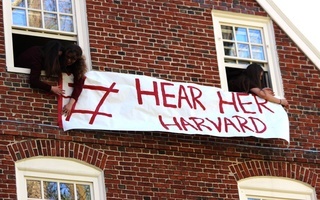 “We felt that the cost was modest relative to the demonstrated need, so we didn’t feel it was an undue burden and we went ahead with it,” said Zak Gingo, Harvard’s Senior Director of Operations. For He, the availability of menstrual products is a matter of gender equality. 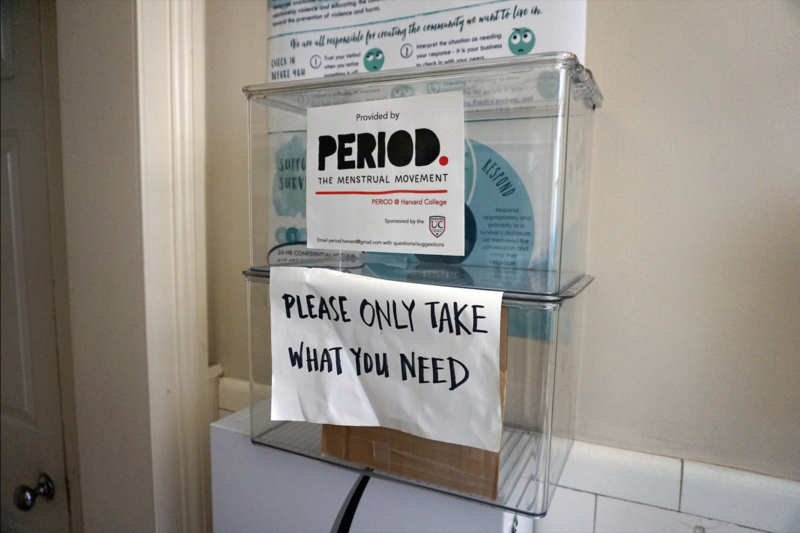 Though UC and PERIOD leaders said they were encouraged by administrators' willingness to fund dispensers in Houses and dorms, their ultimate goal would be to make hygiene products available in a significant number of academic buildings around campus as well. “For now, though, we could not be more excited to see that this is here for the start of the year,” Boucher said. —Staff writer Jonah S. Berger can be reached at jonah.berger@thecrimson.com. ​The Undergraduate Council will conduct a survey to gather student input on current mental health resources and inclusion on campus.